My friend and I have decided to end our blog, Manners for Modern Mothers. I am sad because it was such an engaging project and Liz was such a wonderful partner in blogging. I am relieved because I am a little weary of worrying about my own manners (or lack there of). 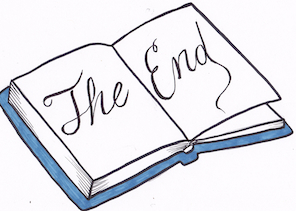 Finally, since this is a blog about making things, I’ll say I am proud of the little “the end” illustration (above) I created for our final post.